What is Natak Eye Drops (Natamycin) used for? 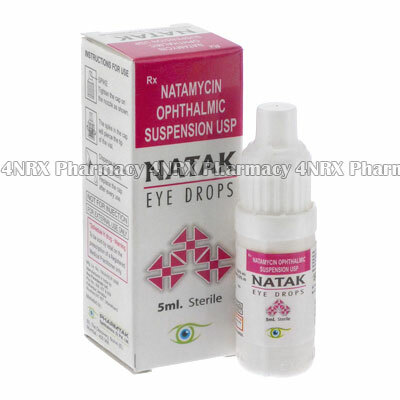 Natak Eye Drops (Natamycin) are type of eye drop containing an antifungal agent suspended in solution. It is indicated in the treatment of fungal infections of the eye such as fungal blepharitis, conjunctivitis, and keratitis caused by susceptible organisms including Fusarium solani keratitis. How should I use Natak Eye Drops (Natamycin)? Natak Eye Drops is available in a 5mL bottle with an included dropper for ease of application. Each bottle contains 50mg of natamycin. For lesser infections, the prescribed dosage may be one drop every three to four hours for the entire treatment. In either case, the treatment timeframe to rid the infection is two to three weeks. Take the drops for as long as you have been advised by your doctor. Do not stop taking the drops just because your eye looks or feels better. What are the side effects of Natak Eye Drops (Natamycin)? If you think you are showing signs or symptoms of an allergy to natamycin, contact your doctor immediately. Natak Eye Drops may be safe to take if you are pregnant or breastfeeding, but check with your doctor first. Regular check of the recovery of the eye may be needed to check the drops are working as intended. In some cases the dosage may need to be adjusted, or treatment stopped and replaced by treatment with another product other than Natamycin Eye Drops.